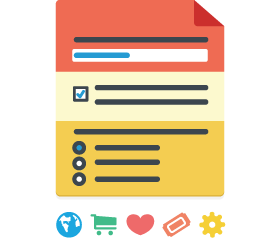 Gain customer insight with our easy-to-use online survey templates. One of Benchmark Email's most powerful features is also its easiest to use. We've designed simple, great-looking templates that grab the attention of your clients and make it fun for them to participate in your research. Use the provided questions or ask your own. Send it out to your email list or post it anywhere on the web. View the answers in real time with easy to read charts or export the data. Get more people to take your surveys by sharing them on Twitter, Facebook or your WordPress blog. You can even add new contacts to your email list automatically as individuals participate. Services Provided - Measure customer satisfaction or them a chance to suggest improvements. Event Participation - Get feedback on your big event. Company Satisfaction - Gain demographic data while you poll your customers. Website Survey - Find out about the effectiveness of your online presence. In-store purchase: Maximize sales with consumer behavior information. Blank Survey: You can design your own survey from the ground up.